It is an honour for Haines Watts to be named as one of GGI’s 2018 Member Firms of the Year. We are proud to be part of GGI and their international network across 124 countries. Haines Watts joined GGI in 2011 because of the quality of members and breadth of worldwide coverage. This gives us the ability to offer clients high quality, professional advice across the globe. We have worked with many GGI members, both in delivering services to their clients and them delivering outstanding advice to our clients. Being nominated by other outstanding professionals for an award that recognises innovation, achievement, strategy and progression within the industry makes this award stand out from others. Haines Watts Partners are committed to GGI, with several of them holding key GGI positions, including Paul Simmons, who is on the Executive Committee and Global Chairperson for Real Estate; Steve McCrindle, Global Chairperson, Indirect Taxes and Andrew Jones, Global Vice Chair for Audit & Accounting. Many thanks to our GGI colleagues for this award. We look forward to continuing providing outstanding professional advice across the globe with other GGI member firms in the future. HAINES WATTS is a UK Top 15 firm of chartered accountants specialising in the owner-managed business sector. It offers an extensive range of services from more than 60 locations across the UK, to more than 35,000 business owner clients. Offit Kurman Attorneys At Law takes great pleasure in accepting the GGI Member Firm of the Year Award for 2018. There is no other environment like GGI, where similarly situated professional service firms share thought leadership and opportunities on a worldwide basis. To be recognised by our peers in GGI as GGI Member Firm of the Year – 2018 is a humbling experience and a great honour. Worldwide recognition as Firm of the Year is something we never expected but aspired for when we joined GGI 6 years ago. Joining GGI has been one of the best decisions we have ever made at Offit Kurman. Our membership in GGI has been a catalyst for our firm’s transition from a law firm with a local clientele, to a law firm with an International presence. Having a group of peers across the globe has enhanced our client service and capabilities. Membership in GGI is another example of how Offit Kurman is committed to seeking the better way to serve its clients while also maintaining high standards. Offit Kurman is dedicated to providing clients with a better way to grow their organisations, protect their businesses’ and families' wealth, and resolve their most challenging legal conflicts. Offit Kurman joined GGI in 2013, and several of the firm’s attorneys and management personnel are active GGI participants. The firm’s CEO and co-founder Theodore “Ted” A. Offit, as well as Managing Partner Timothy Lynch, currently serve as Global Chairmen of GGI’s Best Practices for Professional Service Organisations Practice Group. Additionally, Jim Ries, Offit Kurman’s Director of Business Development, serves as Global Chair for GGI’s Business Development & Marketing (BDM) Practice Group. Vargas Alencastre, García & Asoc. S.C.R.L. Our firm is delighted and appreciative to receive the GGI Member Firm of the Year Award 2018 during GGI’s World Conference in Buenos Aires, Argentina in October 2018. It is a great honour to be placed in such distinguished rank as those of the other GGI member firms. With more than 20 years in the local and international market; Vargas Alencastre, García & Asoc. S.C.R.L. is a Company based in Lima that specializes in providing auditing; BPS outsourcing, Transfer Pricing, consulting services as well as Tax and legal advice to entrepreneurs and their businesses, the firm can address the many needs of small, growing and middle market companies. Vargas Alencastre, García & Asoc. S.C.R.L. 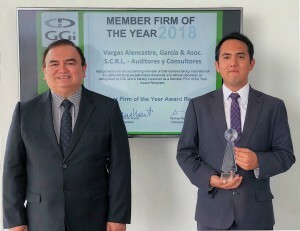 managed by Carlos Vargas Alencastre has been an active GGI participant since it joined in 2001 since then it has built very important business relations. We would like to thank GGI for organising these important conferences which allow us to establish many valuable contacts. We feel proud to belong to this important alliance which is consistently ranked among the top ten associations worldwide. We look forward to working with GGI for many more years to come.